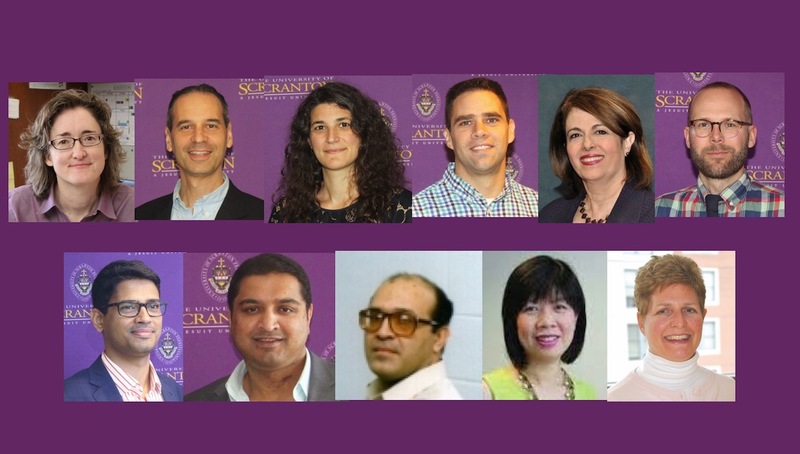 Eleven faculty members received University of Scranton development intersession grants for January 2019. The University of Scranton awarded faculty development intersession grants for 2019 to 11 faculty members from eight departments. Maureen Carroll, Ph.D., professor of mathematics, will receive a grant to study “Geometry in Motion.” Dr. Carroll received her bachelor’s degree from LaSelle University and her master’s and doctoral degrees from Lehigh University. She has worked for the University since 1995. Will Cohen, Ph.D., associate professor of theology and religious studies, will receive a grant to study “Aarhus 1964 and the Dialogue between Orthodox and Oriental Orthodox Christians.” Dr. Cohen received his bachelor’s degree from Brown University, his master’s degree from St. Vladmir’s Orthodox Theological Seminary and his doctorate from The Catholic University of America. He has worked for the University since 2009. Eleni Gousgounis, Ph.D., associate professor of economics and finance, will receive a grant to study “Why do new futures contracts succeed or fail? The case of the FTSE Emerging Index Futures (EMF) contract.” Dr. Gousgounis received her bachelor’s degree from Athens University of Economics and Business and her master’s and doctoral degrees from The City University of New York. She began working for the University in 2018. Christopher Haw, Ph.D., assistant professor of theology and religious studies, will receive a grant to work on “The Development of an Institutional Memorandum Toward Proposing a Prison Education Initiative entailing an Associate’s and eventual Bachelor’s Degree, through The University of Scranton.” Dr. Haw received his bachelor’s degree from Eastern University, his master’s degree from Villanova University and his doctorate from the University of Notre Dame. He began working for the University in 2018. Hengameh Hosseini, Ph.D., assistant professor of health administration and human resources, will receive a grant to study “Misinformation in Youtube Videos about Sarcopenia and Frailty in Older Americans: Content and Network Analysis.”Dr. Hosseini received her bachelor’s degree from the University of Tehran, her master’s degree at King’s College and her doctorate from Marywood University. She began working for the University in 2018. Andrew LaZella, Ph.D., associate professor of philosophy, LaZella will receive a grant to study “Status-Nominalism and The Problem of Universals.” Dr. LaZella received his bachelor’s degree from Hamline University and his master’s and doctoral degrees from DePaul University. He has worked for the University since 2010. Mohammad Maktoomi, Ph.D., assistant professor of physics/electrical engineering, will receive a grant to study “Dual-Band RF Energy Harvesting Circuit for IOTs.” Dr. Maktoomi received his bachelor’s degree from Aligarh Muslim University and his master’s and doctoral degrees from Indraprastha Institute of Information Technology. He began working for the University in 2018. Sufyan Mohammed, Ph.D., associate professor of communication, will receive a grant to study “The Evolution of Social Media Use by Corporate India over the Past Decade: How the Top 500 Companies in India Utilize Digital and Social Media for Customer Relationship Management (CRM) and Media Relations.” Dr. Mohammed received his bachelor’s degree from Jai Hind College, his master’s degrees from Rizvi Institute of Management Studies and Research and Rochester Institute of Technology and his doctorate from Texas Tech University. He has worked for the University since 2008. Masood Otarod, Sc.D., professor of mathematics, will receive a grant to study “Factorization Model: Dimensionally reduced dispersion model for the performance assessment of packed catalytic reactors.” Dr. Otarod received his bachelor’s degree from Pahlavi University and his master’s and doctoral degrees from Columbia University. He has worked for the University since 1988. Ann Pang-White, Ph.D., professor of philosophy, will receive a grant to study “Knowledge, Virtue and Akrasia in Early Confucian Ethics.” Dr. Pang-White received her bachelor’s degree from Tung-Hai University, her master’s degree from the University of South Carolina – Columbia and her doctorate from Marquette University. She has worked for the University since 1997. Janice Voltzow, Ph.D., professor of biology, will receive a grant to study the “Structure and Function of Abalone, Delicious and Beautiful Snails.” Dr. Voltzow received her bachelor’s degree from Yale University and her doctorate from Duke University. She has worked for the University since 1996.